It is decidedly only May! What better place to be than in the garden. It is growing like wild in this heat. And all the critters think it is June, too. Spiders are busy already spinning their beautiful artistry. More butterflies this year than ever! Love it! Love your garden! Go out and find something new each day. It's springtime and HOPE and renewal are at every turn. It sure does seem like summer. What a great spider web photo! My favorite time of day is when I take my early morning walk through the garden to see if there is anything new. The gingers are shooting up. Now the caladiums that I won are starting to pop up. Can't believe the cannas! Last year a neighbor gave me one (beautiful bright orange and yellow)..now there are 5. The original is loaded with buds. What a great time of year!! 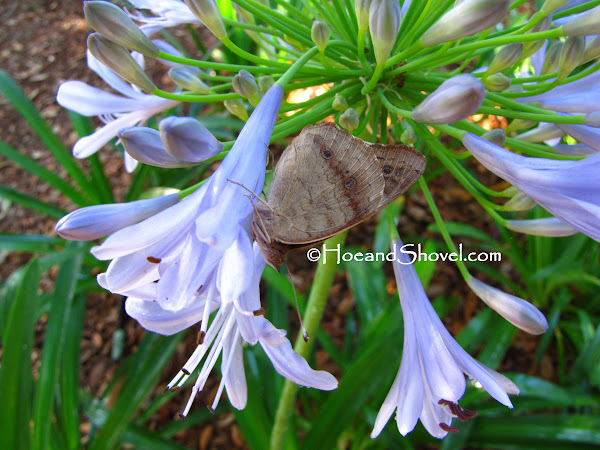 The cool mornings and the breeze and dry air made it pleasant this weekend for gardening, tennis, grilling and relaxing in our garden and enjoying the numerous butterflies and birds of all kinds. We are really enjoying the New Classic Caladium varieties we have planted throughout. My favorite is Peppermint.http://www.classiccaladiums.com/varieties/peppermint_caladiums.htm Do you have it growing? It makes great cut foliage that lasts and lasts. I look forward to your caladium posts too. Good morning Meems ~ It certainly does feel like June. We did get a little rain last night which was so needed, and I am thankful for. Love the pictures of your wonderful garden. 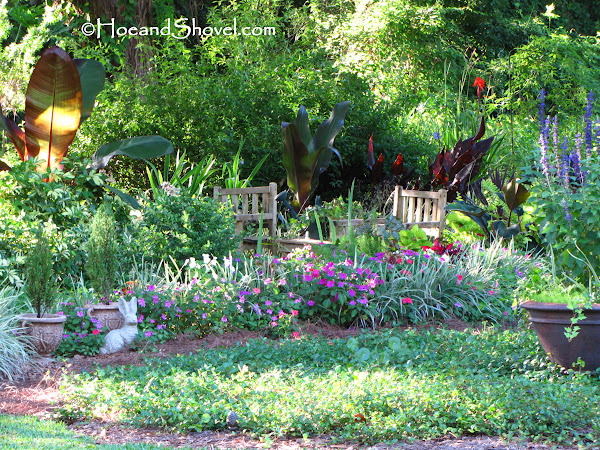 I am so inspired by other FL gardens and gardeners. I do love my gardens and there is something new to see just about every day if we will only look around us. My batteries for camera will be charged up this morning, so I plan to take some pictures then. I have a canna grown from seed, that is doing very well, with another one coming up along beside this one. Herbs from seed, also ruby red papaya, and it feels so good to be out among it all. That chair looks mighty inviting. Around here May or June is about the same. In June the butterflies are between broods so we see less of them though. Oh my it has been hot and humid. Your photos are wonderful, love the capture of the web. Speaking of walking irises, Ms. Doris has some in a hanging container and it is so pretty..think I'll borrow that idea, just wanted to share it. Good morning Meems...It sure is warming up quickly and it's amazing how quickly plants recover and look as if winter never even happened. It's this time of year when I have to force myself to go indoors. This weekend we watched as the hawks and osprey hunted endlessly for food for the young 'uns. Love the pic of the spider web...it's a beauty! Have a great week! Me, too... early morning hand-watering my newly planted materials or container gardens. Glorious this weekend especially. Yes, the gingers, the cannas, the caladiums all waking up in a happy mood. Ah, Rick, that dry air this weekend was stupendous. Could NOT make myself come indoors for other responsibilities/commitments... just reveled in the garden thinking it may be the LAST front we see taking the humidity down for a bit. SO, SO wonderful. My Peppermint has not been planted... waiting until mid-May to get them in the ground. All existing bulbs should be up by then and I'll know better where to site the new ones. Glad to hear it is working well for you. Cutting them for fresh arrangements is a favorite here, too. So happy to hear you finally got some much needed rain. You all missed out on the 'many inches' we got in April. It was a great rain month here considering it is typically completely dry. I admire your patience growing canna from seed and your hort abilities! It is amazing that without a camera journal of the growth in our gardens it would leave one skeptical just telling the tale of how fast it grows in springtime. Around here June is full-on summer. Thanks again for the ID on the Buckeye yesterday. Your yard has certainly filled in quickly this spring. It looks wonderful! A question...Did you purchase your chairs already finished in that dark color or did you refinish them yourself? Thanks for the pics. And, thanks for the "Name/URL". 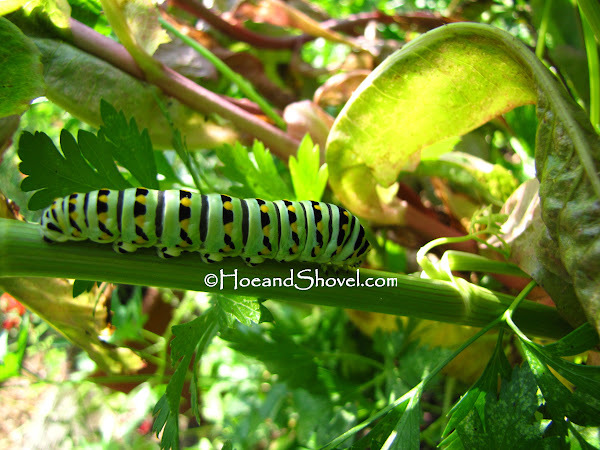 Your lovely gardening is certainly popping with critters and colors! We've been gardening like crazy since we got back from France on April 17. Lots and lots of work done and my husband has really gotten into helping me solve the problems and improve the unsightly! What a lovely vista! Enjoy the waning cool mornings, Meems! Thanks for the reminder to appreciate each new addition. Love the photo of the spider web! My garden is growing like crazy too. The first caladiums I planted after being inspired by your blog entry are popping up -- it's like a mini-Christmas every morning! The spider photo is fantastic!! Congrats on capturing it. Yes, June has arrived in May and I am loving it here in Charleston. Bring on the heat! You have a keen eye... yes, needs to be snipped... those things pop out so quickly. Love your new profile photo! Thank you. Purchased those chairs... black paint over cedar wood. I really love what you two have done since you've returned. Glad to see you are enjoying your garden this spring. Completely thrilled over the cooler mornings this weekend/week. Hoping it lasts for a while. So excited to see every caladium leaf pop out of the ground... so happy you are loving yours, too. They are the perfect summer color! I'm wishing the heat would hold off... you want more... maybe we should trade places. I wish it felt more like June to me! I could use a little more rain. All the plants that have been battered by the hose I'm dragging around are chorusing, "Yes! Yes!" Lovely pix, Meems, and your garden looks really beautiful. Meems: First, thanks for featuring my blog as recommended Florida blog of the week. This is such a honor! Yes, the weather has been so hot recently, and I almost can not get into the garden in the middle of the day any more. Foutunately I usually only garden at night any way :) All the plants growing so fast in my garden, some become unbelievebly big. Your garden looks so beautiful and lush, as always! My agapanthus has not set the flower spike yet. Always wonder if I have put them in the right location. Yours is already fully blooming! Love the pictures of your wonderful garden. What wonderful rich color! What a fantastic place your garden must be! I think I've finally reduced hose dragging to newly planted areas until established and container plants. Still, it's a constant necessity... even in June. Rain was a blessing in April... we had several inches and it is usually bone dry. Could definitely use some now. Spiders are even out early due to early heat-up this spring. Hate-it when I walk through webs. If not for my shade I would not be in the garden in the middle of the day either. Following the shade around is a blessing. Some of my agapanthus are blooming and some are not yet. Several of them are newly planted in the front garden where I took out all the grass. They can take a good deal of sun but it has been my observation they do not do as well in full sun... a filtered light situation is ideal for them. I feel sure you make the most of your time in the garden. I'm a morning and evening coffee-in-the-garden gardener, too. LOVE that. Meems, Maybe the cool front we're having will move your way and bring back May! 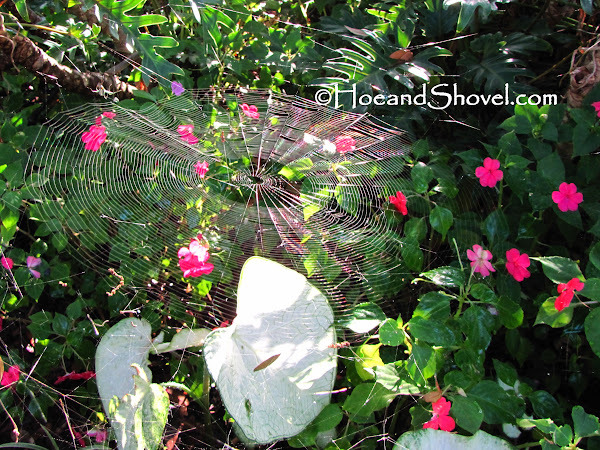 It sure looks wonderful in your garden...I am in awe of the fantastic spider web photo! 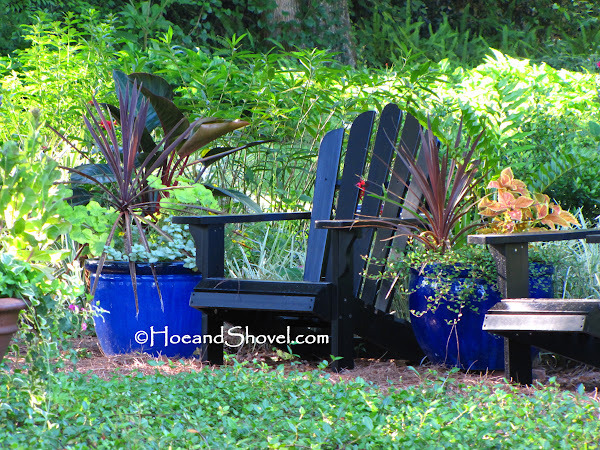 If I may be so bold~Someday, I hope to sit in one of your comfy chairs and visit with you! xxoogail My dear, what do you do to protect yourself from skeeters? Ours will be getting awful pretty soon. The cool front didn't reach this far south and likely we won't get anymore this season. Here comes summer! A guest room and comfy chairs await, my friend. The skeeters are already bad. Repellant is a must as they especially like a garden full of foliage.